Actors’ Playhouse brings back the much-anticipated return of the Tony Award-winning Broadway musical Million Dollar Quartet. One of the company’s most acclaimed (and longest running) productions in its 30-year history, Million Dollar Quartet will once again rock the Balcony Theatre from May 9 – June 24, 2018. This high voltage rock ‘n’ roll show, with book by Colin Escott and Floyd Mutrux, is inspired by the electrifying true story of the famed recording session that brought together music icons Elvis Presley, Johnny Cash, Jerry Lee Lewis and Carl Perkins for one of the greatest jam sessions of all time. Featuring over 20 timeless hits such as "Blue Suede Shoes," "Great Balls of Fire," "I Walk the Line," "Whole Lotta Shakin' Goin' On," "Fever," "Folsom Prison Blues," "Hound Dog" and more, this thrilling musical brings audiences inside the recording studio with four major talents who came together to create a red-hot rock ‘n’ roll band for one unforgettable night. Directed by award-winning Actors’ Playhouse Artistic Director David Arisco, this smash-hit sensation features an incredible score of rock ‘n’ roll, gospel, R&B and country hits, performed live onstage by world-class actors who play their own instruments, as well as sing and perform. 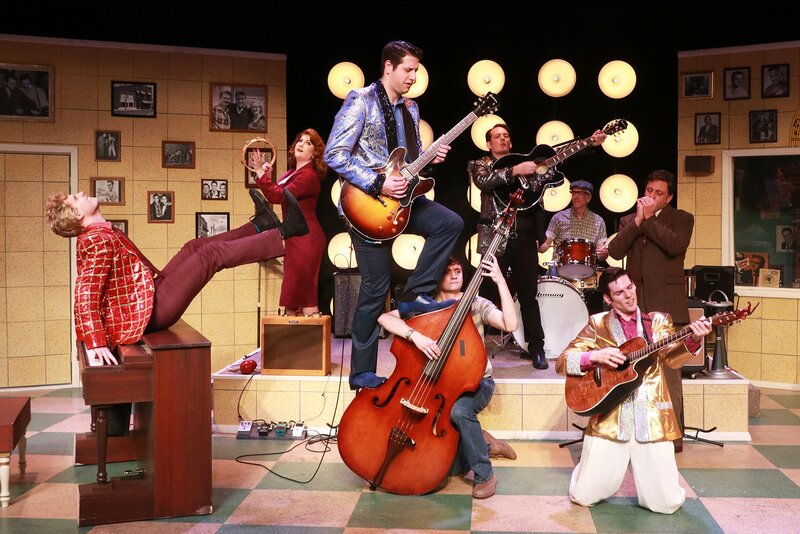 Returning cast members include Dominique Scott, who won the “Best Supporting Actor in a Musical” Carbonell Award for his role in Actors’ Playhouse’s 2016 production of Million Dollar Quartet, as Jerry Lee Lewis; Jeremy Sevelovitz as Carl Perkins, Sky Seals as Johnny Cash and Lindsey Corey as Elvis’ girlfriend Dyanne. Making his debut at Actors’ Playhouse as Elvis Presley is Corbin Mayer. Mr. Mayer is not new to the production, having performed as Johnny Cash in regional productions of Million Dollar Quartet at ZACH Theatre, Lyric Theatre of Oklahoma and The Majestic Theatre. Gregg Weiner, last seen at Actors’ Playhouse in The Trial of Ebenezer Scrooge and Scott and Hem joins the cast as Sam Phillips. David Sonneborn, who understudied for Brother Jay/Fluke for the complete national tour of Million Dollar Quartet and has performed the show regionally across the country, will play drums/Fluke. Daniel Bailey, cousin of Dominique Scott, rounds out the cast as Brother Jay on the bass. The creative team for Million Dollar Quartet includes Scenic Design by Gene Seyffer, Lighting Design by Eric Nelson, Sound Design by Shaun Mitchell, Costume Design by Ellis Tillman and Properties Design and Set Dressing by Jodi Dellaventura. The show will open on Friday, May 11, 2018 at 8 p.m. and play through June 24, 2018. Evening performances will be held Wednesday through Saturday at 8 p.m., with afternoon matinees on Sunday at 3 p.m. A special weekday matinee is scheduled on Wednesday, May 16, 2018 at 2 p.m.
Director David Arisco will lead a group discussion with the cast following the performance on May 18, 2018 as part of the company’s “Second Fridays” series. For tickets and more information, contact the box office at 305-444-9293 or visit www.actorsplayhouse.org.